After being back for two weeks from my trip, I am still going through my photographs: numbering, naming, categorizing, copying, printing, drawing, cataloguing. My computer is my archive and I am the archivist still configuring how to dictate the information I have been given. By city? By date? By formal gestures of line, perspective, pattern? Alphabetical by person or place? By theoretical meaning? By dichotomies? By social significance? The arrangement seems to move everytime I go into a folder and see the visuals I took. How quickly I forgot what I had collected! And magnetic north is moving. 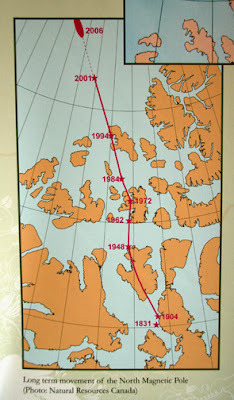 The photograph of the map presented is from the Fram Museum, Oslo showing the progression of when Captain John Ross (1831) first took the magnetic calculations then Amundsen (1904) and all the way up until 2006's calculations. It is projected that soon the north will be closer to Russia, the northeast passage, then to Canadian waters. I wonder how that will effect Russian vs. U.S. relations? Matt, my partner, is curating a show in Ann Arbor titled 'Studio in the Lab' in September. Investigating the intersections within the arts and the sciences, I hope to submit some work involving the images and writing from my research trip. How a visual artist reimagines and represents history/ anthropology/ politics/ cultural studies offers many chances and allowances for bending and of course reinvestigating the academic and social rules. I think of Chris Olfili's massive (and glittery) paintings, Kara Walker's installations of power structures during the American Civil War, Zhang Huan's facial 'Family Tree', Coco Fusco performance with Guillermo Gomez-Pena in the cage as modern day savages, or Song Dong's gestural 'Stamping the Water' performance/photograph piece. These isolate fragments of cultural understandings and translates them. The artists ask questions without needing to preliminarily bend to a hypothesis. They aren't concerned with answers. Through curiosity, they ask what might occur. I hope to approach my photographs in this way. Gleaning from anthropology, history, intuitive formal gestures: the other 'sciences'. To hover the images while offering the viewer clues as to where the points may end up.